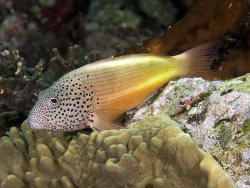 Underwater coral reefs also provide habitat for the ultimate “couch potatoes” hawkfishes. 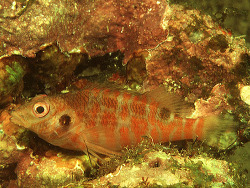 They belong to the family „Cirrhitidae“ currently consisting worldwide of 35 species in nine genera plus one species of morwongs, which are closely related to hawkfishes. 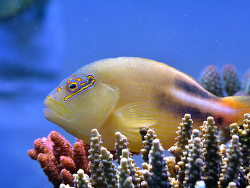 They are a small opportunistic predatory family that spend most of their time on protruding coral blocks or branches of the reef. 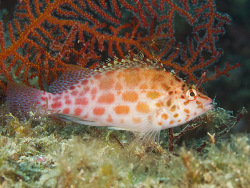 When it does, a hawkfish can move as swiftly as a hawk to grab its meal and even indulge in a vigorous chase — at least for short distances. 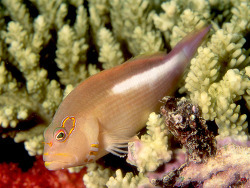 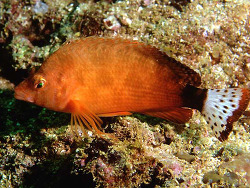 Once a meal is caught and devoured, the hawkfish will return to its favorite pastime, sitting motionless on the reef and waiting for the next likely meal to appear. 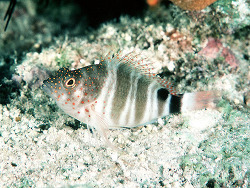 Their seemingly continuous, sedentary "perching" is about the only negative thing that can be said about the Hawkfishes. 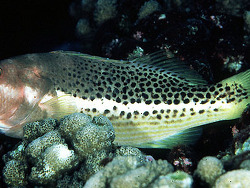 Territorialism and the habit of males to maintain their own private harems of females are additional characteristics. 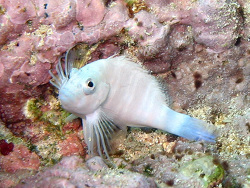 Some species of hawkfishes begin life as females and later one will change into a male. 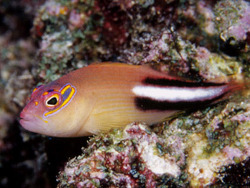 Hawkfishes are active during the day. 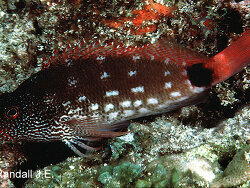 The distribution range is mainly the whole Indo-Pacific with two species in the tropical West and East Atlantic. 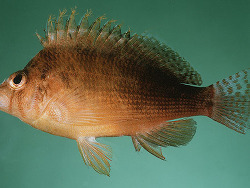 Most species are found in shallow water with some to a few hundred feet. 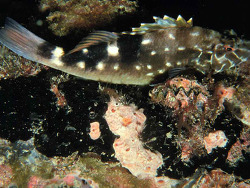 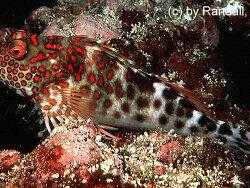 Hawkfishes are strongly associated with coral reefs, they are most found in the upper part of the reef. 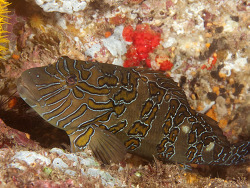 These are another small, fairly peaceful, hardy, colorful and interesting fishes are undemanding in terms of water quality and foods; get along well with other species and are generally fast-enough and tankmate-wise to avoid being hassled. 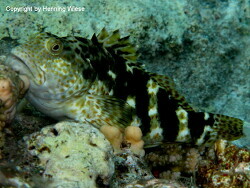 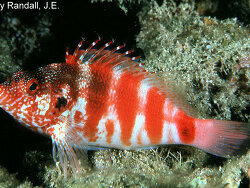 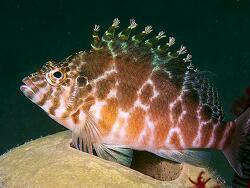 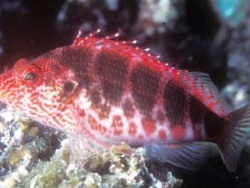 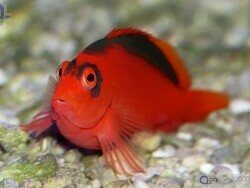 Hawkfish is kept in fish-only community aquariums as well as in reef tanks. 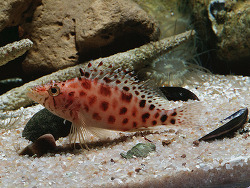 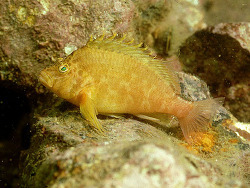 You should however keep in mind that the hawkfish will eat most animals including smal fishes as well as worms, shrimps and smal crabs, if they are small enough to devour. 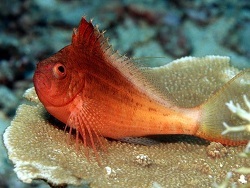 hawkfishes are equipped with sharp teeth and powerful jaws and can easily crush the protective shell of any crustacean.